So the official announcement of the 1:50 Batgirl Cycle as the SDCC promo vehicle is now okay to talk about. There may be photos on Friday. Check on the 1966 Batmobile board for more info. Looks like it’s part of a three pack at least at the show, which leads me to believe they might do a mass release of it on a single card. Here’s hoping, anyway. We have a winner! 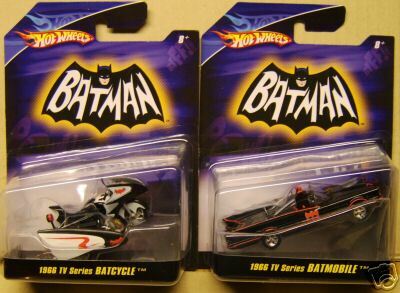 Of the 167 registered users we had as of 6/1 our random number generator selected mnbatman as the recipient of the 1:50 Batmobile and Batcycle set! If you’re out there, mnbatman – give us a shout. So let’s see what else…The seated figure samples just got here and they look better than we had hoped for. Production starts rolling and we should be shipping those out very soon. Thanks for all your patience. And we are almost set to start production of the Parts Upgrade set #1 which will include a modified version of the Elite’s newly resized batphone. So some of you wanting to stick to customizing the standard edition can get the only useful part from the Elite version for your mod job. And it will be better. How? Wait and see. I wish the guys that run the 1966 Batmobile board would answer my emails about getting signed up, not being able to get on that sites Message boards. where do i get one of these and what are the other SDCC Batman Exclusives? The main place this set of 3 cars is designed to sell at is at the San Diego Comic-con in July. It been years since I’ve been to one, but it is a HUGE deal! The set will be a limited edition (I don’t know how many yet) on a first come first served basis. 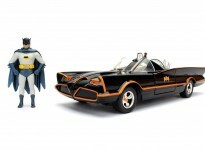 Last year they offer a few of the 1/64 scale Batmobiles to the Hot Wheels Red Line Club, but sold out VERY quickly. single pice some time this year, but probably will be hard to find for a while. Haven’t heard anything about any other SDCC batman promos yet. I would email Eric about the 1966 batmobile board problems. I have emailed Eric and recieved no response. I don’t think anyone has any detailed information on the SDCC thing yet. Keep checking back.